Francis Noble Ratcliffe was born at Calcutta, India on 11 January 1904. 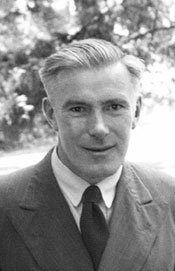 After graduating with First- Class Honours in Zoology from Oxford University, Dr Ratcliffe spent a year at Princeton University as a Proctor Fellow before coming to Australia to work for CSIRO in 1929. He first studied the giant fruit bats of the eastern seaboard, then went on to study soil erosion in the inland. These two subjects formed the basis of his classic book Flying Fox and Drifting Sand. As a member of the Division of Entomology from 1937 to 1949, he worked on termites and pests of stored wheat. He also served for some time with the Royal Australian Army Medical Corps (RAAMC) as a malariologist investigating mosquito control techniques. In 1949, the Wildlife Section was established under his leadership. In the next ten years he collaborated with Professor Frank Fenner of the Australian National University (ANU) to achieve spectacular success in the control of rabbits by myxomatosis. In 1961, Dr Ratcliffe returned to the Division of Entomology as Assistant Chief. He was awarded an Order of the British Empire (OBE) in 1957 and an honorary degree of Doctor of Science by the ANU in 1968.